In late January, members of the Academy’s faculty and staff attended the Future of Education Technology Conference (FETC) in Orlando, Florida. 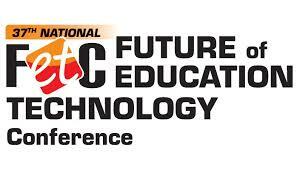 The FETC is the largest independent education technology conference in the country, offering workshops and concurrent sessions, live demonstrations of new technology, and a large expo of vendors. Alexa Kressaty, Ashley Eckhardt, and Mary Finkenkeller spent 4 days absorbing as much information and gathering as many resources as they could to bring back to the rest of the team at the Academy. 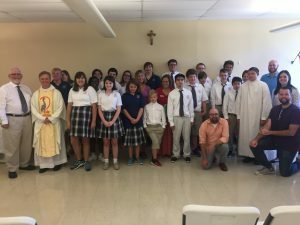 Between the 3 of them, they attended 8 workshops and over 20 concurrent sessions gathering hundreds of resources for the faculty, staff, parents, and students at the Academy. Working mostly in an administrative roll, Finkenkeller attended workshops on where to find and how to apply for grants, Google Drive organisation and application use, and creating videos using different software to be used in public relations and encourage parent involvement. She focused most of her time at the FETC toward learning the best strategies for fundraising and the proper use of social media to reach the community. Eckhardt and Kressaty, teachers at the Academy, attended workshops and concurrent sessions dedicated to the use of assistive technology in special education. Since the students at the Academy have access to iPads and Chromebooks, the teachers attended workshops on how to make the technology more accessible for all students. They picked up tips about certain apps or extensions on Chromebooks that can help students with learning disabilities master skills like typing, graphic organization, leveled text note taking, and time management. Also, accessibility features on the iPad can make any number of adjustments to help provide students with the best platform for their individual learning style. Eckhardt and Kressaty even attended a workshop dedicated to Lego-based therapy demonstrating how simply playing with Lego’s can build a child’s social skills. 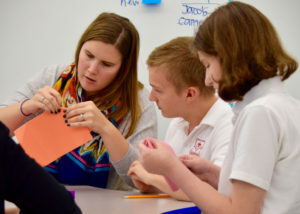 One strategy they hope to implement in their classrooms at the Academy involves each student being assigned a roll with a certain task, and all of the students will need to communicate and work together to build the lego set as a team. While the others attended FETC in Orlando, Terri O’Daniel, the Academy’s Executive Director, went to visit the new grounds for a large housing project for young adults with learning disabilities in West Melbourne, Florida. Promise in Brevard is the brainchild of Betsy Farmer and her son, Jack. The complex is under construction now and will be an entire complex dedicated to the housing, employment, and success of adults with learning disabilities and physical impairments. Promise plans to provide housing, life enrichment, and freedom to 126 residents in a complex that will include individual apartments, pool, cafe where 40 residents can find employment, art center, garden, stables and therapeutic riding sessions, and full-size gym. Any residents who are unemployed can also participate in a skill development program where they will learn a trade to assist them in finding employment. They also have plans to build nearby condos for the families of the residents. This will allow the resident to have his/her independence while also having the close support of their family. O’Daniel spent time touring the construction site and talking in great detail with Farmer about all of the work she has committed to this project and her bright plans for the future. Overall, traveling to Orlando had a great positive impact on all 4 Academy staff members. They explored new possibilities for our students after they graduate from the Academy, learned how to properly implement new fundraising and PR campaigns, saw how it is possible to make the technology in our classrooms more accessible for all students to use, and found resources that are individualized, meaningful, and can be implemented at anytime.